Tags are everywhere on the web today. these short words make life very easy. Tagging files with various keywords is always better than traditional search options since tagging lets you find things based on general categories instead of exact keywords whereas the windows search finds files based on file names and other parameters. Also, a tag cloud built out of your tags gives you a precise idea of what kind of files are available on your computer and in what amount. In this article we tell how how to tag your files on your windows system and generate a tag cloud out of it. 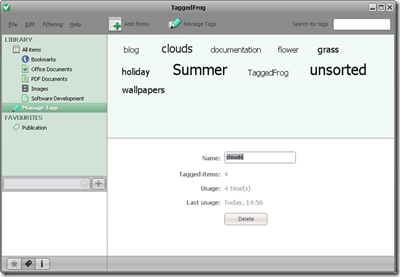 TaggedFrog is an application that lets you add tags to your Windows files (like Microsoft Office documents, PDF documents and images) and web links. In fact, you can tag any kind of file. 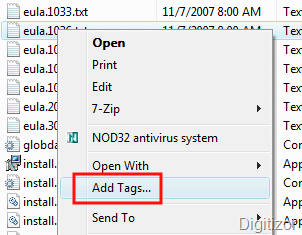 As the application is integrated with Explorer’s context menu, you can tag files directly by right clicking on them and selecting “Add Tags”. If you have too many files to tag manually, you might want to try the Auto Scan and Tag feature instead.